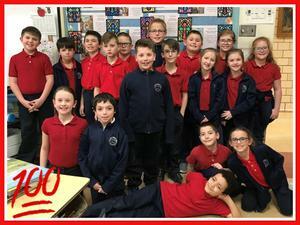 In preparation for their First, Holy Communion, second graders gathered together and completed meaningful activities to help their hearts and minds grow closer to Jesus. Activities included: rosary making, baking bread, creating banners, writing prayers, and hearing the Good Shepherd presentation. Special thanks to Mrs. Gabet and her parent volunteers for providing such a memorable and special experience for our students. 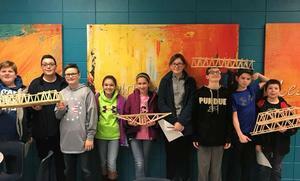 We had 4 STEM teams compete in the 20th Annual Bridge Building Competition held at Concordia Lutheran High School. All of the teams put forth their best efforts and we are so proud of them! The gears are already turning for next years competition! The 8th grade girls basketball team are CYO champs! They won both the regular season and tournament. This is the second year in a row for this group of girls to win the CYO tournament! We are so proud of the mark they are leaving at St. John's! Mission: Develop a closer relationship with God and strengthen our Catholic community spirit at St. John's.